Looking for info on the January 31, 2018, lunar eclipse? 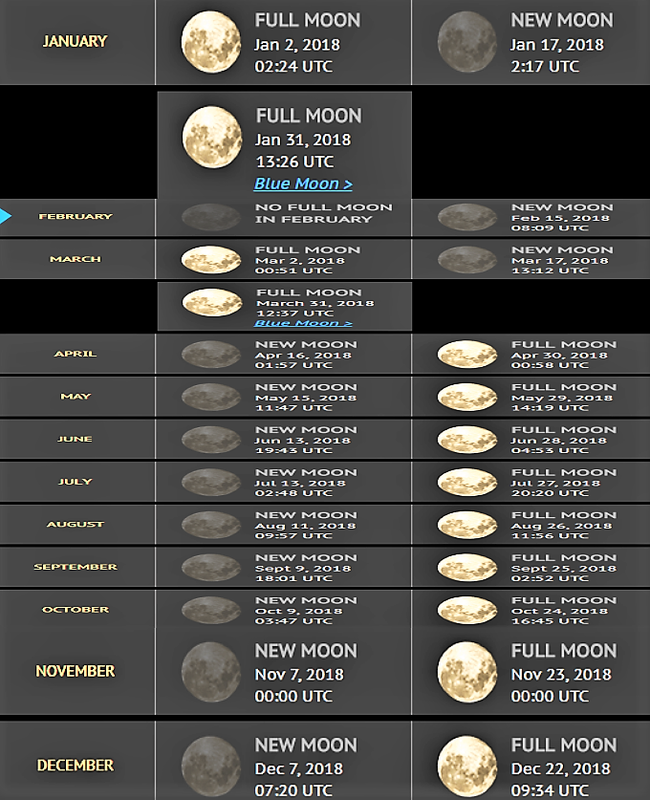 This year, 2018, we have two months (January and March) with Blue Moons. They are Blue Moons by the monthly definition of the term: the second of two full moons to fall within a single calendar month. 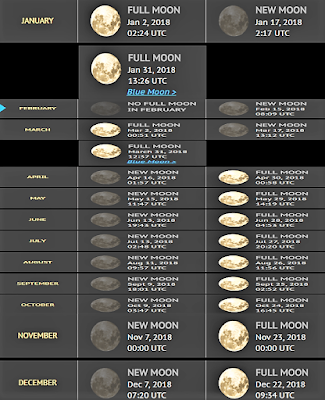 The first Blue Moon comes on January 31, 2018, and the second on March 31, 2018. The first Blue Moon of 2018 was the spectacular Super Blue Blood Moon of Jan. 31. 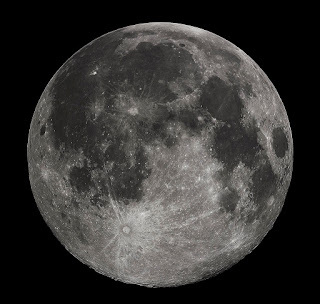 Supermoon - As the moniker suggests, the Moon will appear 14% bigger and 30% brighter. But you won’t be able to tell the difference under the naked eye. The supermoon occurs when the Moon is closest to Earth (aka perigee) in its elliptic orbit. 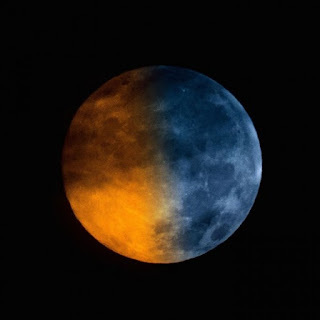 Blue moon - It has nothing to do with the Moon turning blue. 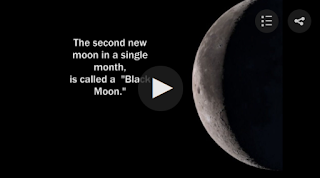 It means that it is the second full moon in a calendar month. This is a rather common phenomenon, occurring every two years or so. 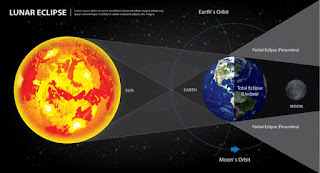 Lunar eclipse - Not to be confused with the solar eclipse, this is when the Moon turns red as the sunlight is blocked by the earth’s shadow and the light seen is refracted through the Earth’s shadow. Coz’ of Rayleigh scattering, the light turns red—that is why sometimes we get paddle pop skies in the evening—and that’s why it looks like a murder happened on the Moon. 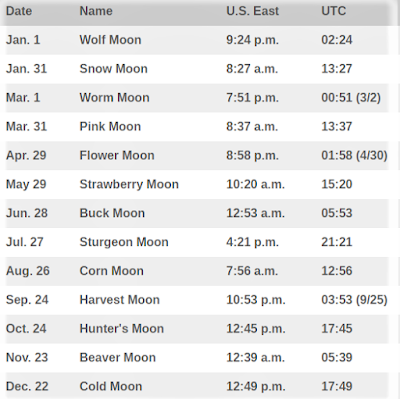 Why is it special - These three lunar events will be happening at the same time today—the lunar holy trinity. 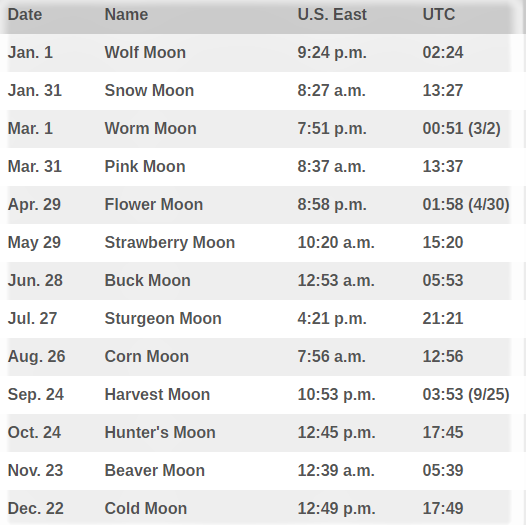 According to Sky and Telescope magazine, the last time a “blue moon” total lunar eclipse occurred was in 1866! While Thaipusam may not be recognised as a public holiday, this spectacular festival attracts thousands of Hindu devotees each year. 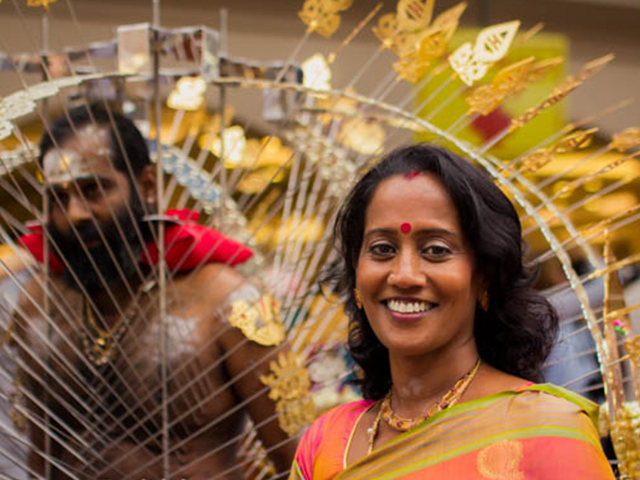 Its most distinctive feature is the large decorated kavadi carried by many participants each year, often ones that incorporate skin piercings. But if all this is new to you, or you still feel like you have no clue what this festival is about, we’ve put together a handy guide that will give you a basic understanding of Thaipusam. The most iconic part of this festival is the kavadi itself. 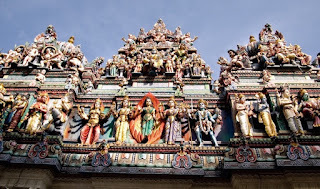 This intricate structure is decorated with flowers and peacock feathers, symbols of Murugan, and can weigh up to 30 kilos. While this may seem like a harrowing experience, kavadi bearers often feel a sense of peace and may even enter a trance-like state. This is aided by live music played by urumi melam (traditional drum) groups that have been allowed to perform at designated areas during the event. Devotees carry the elaborately decorated kavadi as a form of ceremonial sacrifice in worship of Murugan. The kavadi’s weight and the hooks pierced through the bearers skin represent a physical burden, through which devotees beseech Murugan for divine help. The bearer also observes celibacy and consumes a single meal of pure Satvik food (essentially vegetarian foods that aren’t pungent) just once a day, beginning 48 hours before Thaipusam begins. The procession of kavadi bearers begins at the Sri Srinivasa Perumal Temple at Serangoon Road and ends at the Sri Thendayuthapani Temple at Tank Road. If you’re keen to see the spectacle firsthand, the Serangoon Road is a good place to watch the procession. Thaipusam falls on 31 January this year. A common misconception is that the festival commemorates Murugan’s birthday, but the date actually marks his vanquishing of the demon Soorapadman. After a span of heavy rainfall on Tuesday evening, hailstones have been reported in several areas of Singapore such as Yishun and Seletar. In addition to this, flash floods have been reported at Seletar North Link. 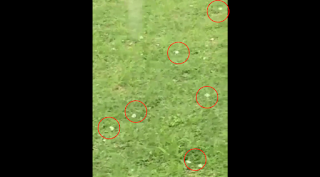 A Facebook user, who goes by the name of Mygolf Sg, posted an amazing video of hailstones during the rainfall at Seletar Country Club. 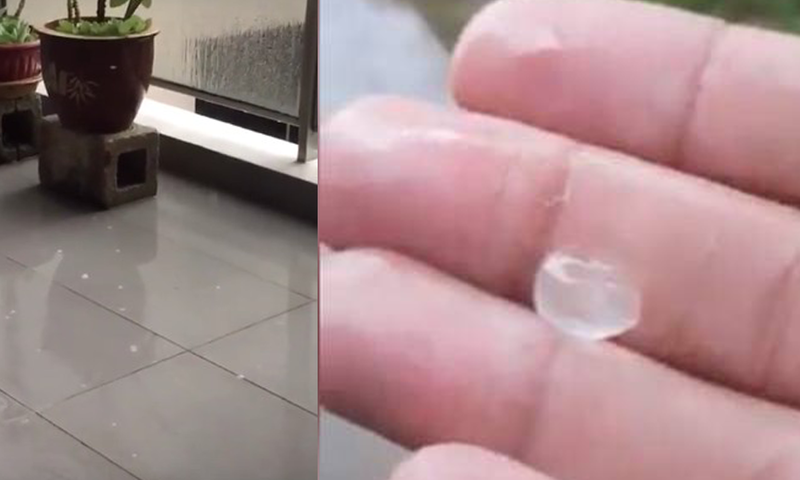 A few other users also posted hail stone videos in other parts of Singapore, including Nanyang Polytechnic. 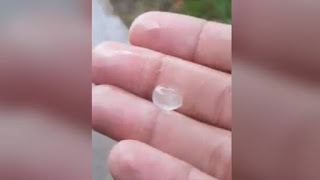 Experts say that hailstorms form within an unusually unstable air mass in which the temperature falloff with height is much greater than normal. 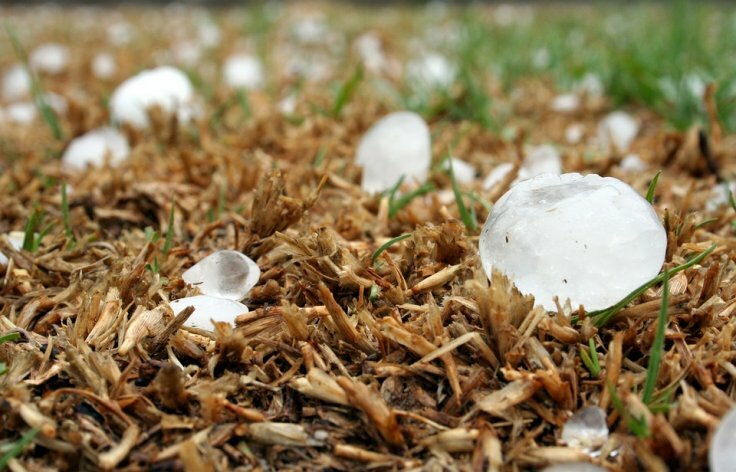 During hailstorms, small ice particles that form above the freezing level generally collect either rainwater or cloud water on them, forming a water shell that freezes. A thunderstorm yesterday afternoon not only flooded roads, but rained hail and toppled several trees in the northeastern part of the island. PUB said in a statement late last night that the flash floods, which ocurred at 5.17pm, were caused by “overland flow from the storm (which) exceeded the capacity of the roadside drains”. The flood subsided around 30 minutes later at 5.45pm. Earlier in the day, the agency had issued a flood alert for Seletar North Link at around 5.30pm, advising motorists to avoid the area as both lanes of the two-lane stretch was flooded by heavy rain. Hailstones were reported in various parts of S'pore on Tuesday (Jan 30) evening amid heavy rain in the north of the island. Ms Sara Thompson, a teacher at GEMS World Academy international school, was on her way home from work when hail struck at Seletar West Link. "We are Canadian, so we know hail when we hear it & see it," she told Channel NewsAsia. A thunderstorm on Tuesday (Jan 30) afternoon not only flooded roads, but rained hail & toppled several trees in the northeastern part of the island. 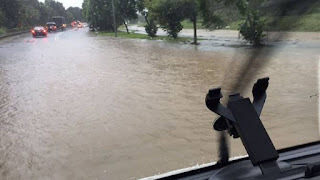 PUB said in a statement late Tuesday night that the flash floods, which ocurred at 5.17pm, were caused by "overland flow from the storm (which) exceeded the capacity of the roadside drains". The flood subsided around 30 minutes later at 5:45pm. 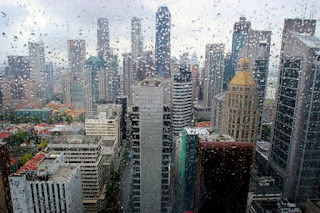 If you follow weather reports closely, you would be prepared for some heavy rain in the northern, eastern and central areas of Singapore. But would you ever expect some hailstones? 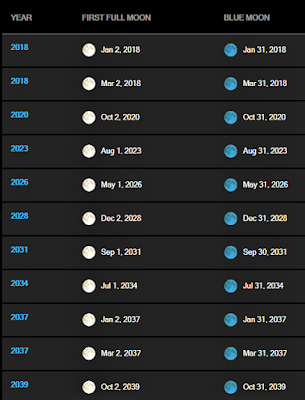 The weather phenomena last occurred in 2013. And it has allegedly happened again at about 4.30pm on Jan. 30, 2018. Multiple people from Yishun to Sengkang were obviously surprised by what was described as “raining ice” by some. Heavy rain fell across Singapore on Tuesday (Jan 30) afternoon, leading to a flash flood at Seletar North Link. 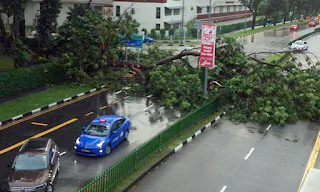 Fallen trees were also reported in various parts of northern Singapore. Tipper truck driver Jackie Yap said he was on the way to work at around 5pm when he saw the flood along Seletar North Link. "I saw two stalled cars in the water. One was a Toyota Wish and another a Toyota Altis," Mr Yap told Channel NewsAsia. "The drivers couldn't do much ... They were very helpless. I could see them making phone calls, probably asking for help." Mr Yap said he saw at least 4 fallen trees on his Seletar journey. Flash floods have been reported at Seletar North Link after a span of heavy rainfall in Singapore on Tuesday afternoon. 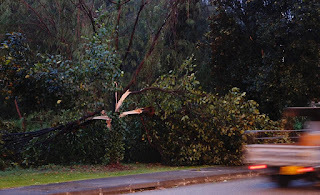 According to Channel NewsAsia report, a tree has fallen down on Tampines Expressway (TPE) due to the impact of the rain. On Twitter, the Land Transport Authority (LTA) posted at 5.10 pm that the Yio Chu Kang Road exit on the TPE was closed due to an "obstacle", which is believed to be the fallen tree. At about 5.30 pm, PUB tweeted that both lanes of the Seletar Road were closed. The motorists were urged to avoid the area. However, 15 minutes later, the authorities tweeted again saying that the traffic was able to pass as the flood had subsided. Residents & store owners in the north of Singapore said that Tuesday evening's (Jan 30) storm caught them by surprise, as they took stock of the damage caused by heavy rain, strong wind & falling trees and branches. 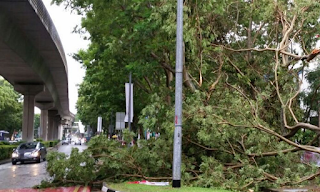 In Chong Pang, a large tree branch fell on one of the tents housing a pasar malam, or night market. “It happened very suddenly and we had no time to keep or stow away our things," said a stall owner who wanted to be identified as Mr Ker. Hail, better known to some as “ice rain” (because they’re essentially solid cubes of water droplets that rain down from the sky) pelted people in Yishun, Seletar and Sengkang this evening. 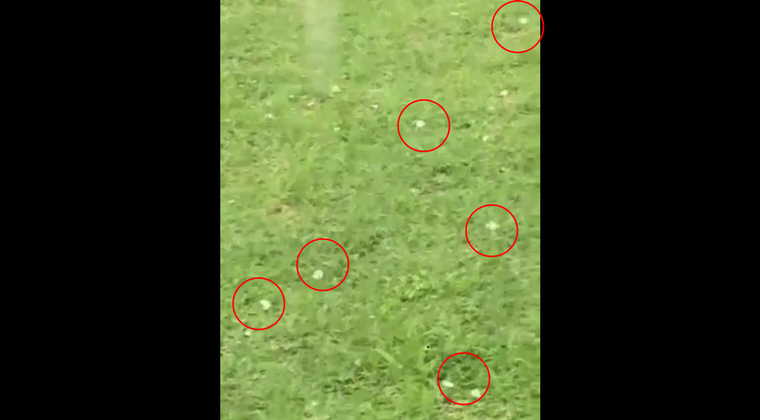 Netizens have shared videos online of hailstones raining down in places like Nangyang Polytechnic (located in Ang Mo Kio) and Seletar Country Club. Other netizens reported incidences of hail in the Sengkang region. This comes as flash floods struck the Seletar region. The floods resulted in multiple fallen trees. While rare, this isn’t the first time that Singapore has experienced hail was seen during a huge thunderstorm around the Turf Club area in Oct 2014, and parts of Bukit Batok in June 2013. 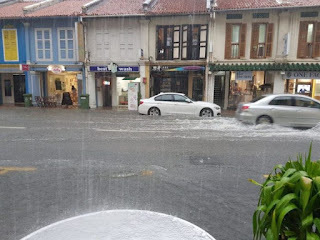 Powerful storms and hailstones assailed northern parts of Singapore like Ang Mo Kio, Yishun and Seletar on Wednesday (30 Jan). Will hailstones pierce through my umbrella? How can a tree that looks so strong still be uprooted? 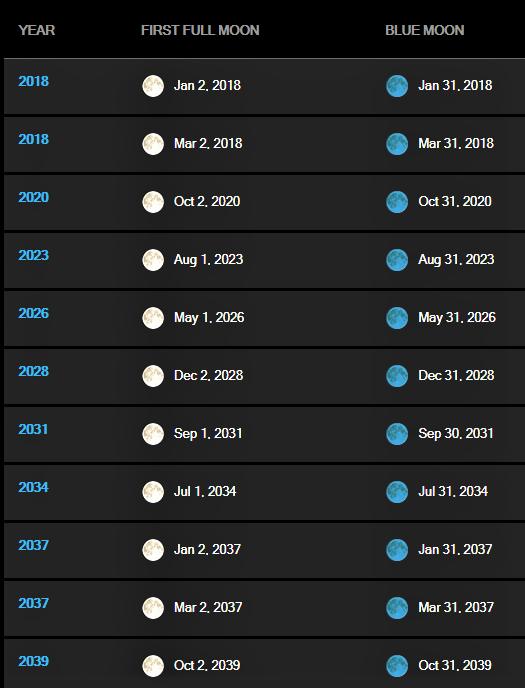 We don’t have a magic crystal ball here at MustShareNews. But you’ll be pleased to know that we do have some answers to your questions. 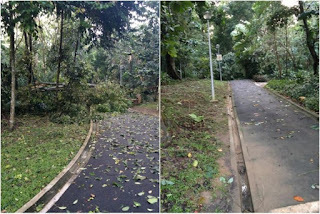 A heavy downpour yesterday caused several trees in Yishun Park to be completely uprooted. At least four such trees have blocked pathways in the park. Joggers and passers-by had to make a detour because of the blocked pathways. 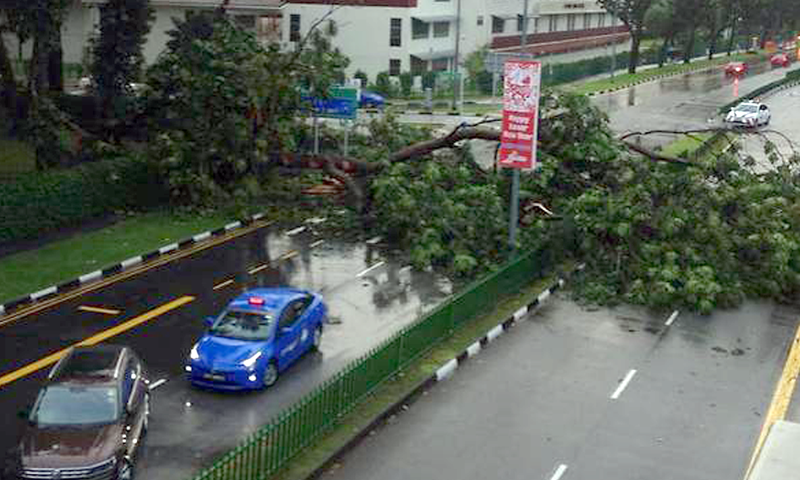 According to a Yishun resident, the wind was very strong and everything was blown horizontally. Contractors are in the midst of clearing the fallen trees. Apart from these uprooted trees, hailstones were also spotted in Yishun and Seletar. 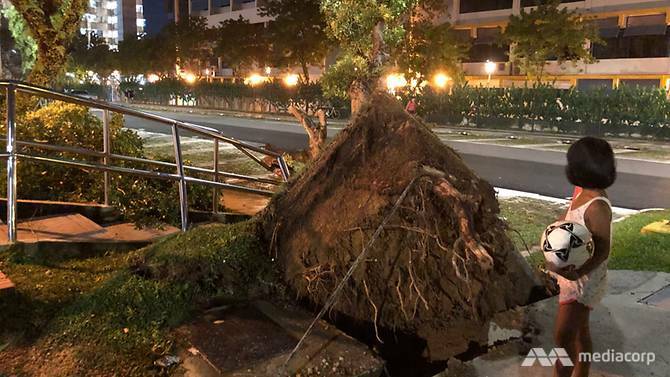 This comes after reports of “intense rain and strong winds” during the late afternoon in the north and northeastern parts of Singapore such as Yishun, Sembawang, Seletar, Mandai and Gambas. Oh said that NParks has had in place a “comprehensive tree management programme” since the early 2000s. According to TODAYonline, flash floods were reported in the Western and Central parts of Singapore yesterday, after an afternoon of heavy rain. The Public Utilities Board (PUB) said in a statement on yesterday night that the flash floods occurred at three locations at around 5.15pm. Jalan Boon Lay/International Road, Craig Road and Outram Road. PUB also said that Jalan Boon Lay/International Road and Craig Road are known flood hotspots. Super strong winds this afternoon sent at least 3 boats flying at East Coast Park. 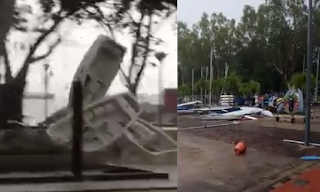 This video shows how the winds tossed 3 Laser sailboats in the air at the National Sailing Centre – each boat weighs about 70kg. The incident took place at about 4pm. 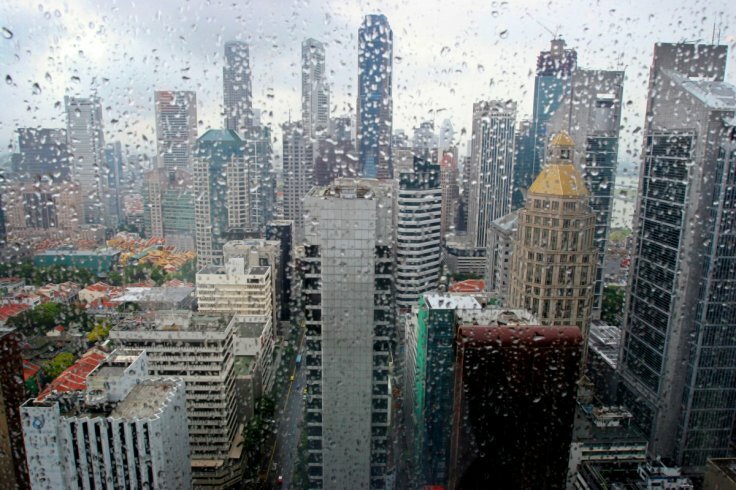 This is the second day that storms have wreaked havoc in Singapore. Yesterday, more than 200 incidents of toppled trees and snapped branches were reported over several parts of the country. 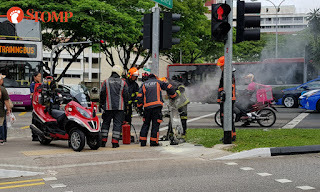 When engineer Philip Toh heard a loud bang during his family gathering at Jalan Bukit Ho Swee on Sunday afternoon (Jan 14), he assumed that it was a traffic accident. But when the 39-yr-old rushed out of the HDB unit to check, he saw a 2-metre long tree branch pierced into his car's front windscreen. "The windscreen was obviously damaged. 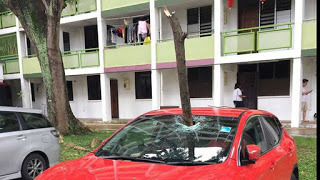 The impact of the branch also caused a dent in the car's bonnet," Mr Toh told Channel NewsAsia. An elderly woman had a narrow escape after a mobility scooter burst into flames & started a fire in a Housing Board block of studio units for the aged in Bedok on Saturday. The devices were not being charged at the time, but one suddenly gave out sparks before catching fire & engulfing the corridor in thick smoke. 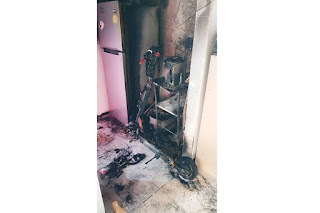 A fire involving a involving a personal mobility device (PMD) broke out in a unit at Block 326C Sumang Walk in Punggol on Tue morning (Sep 25). The Singapore Civil Defence Force (SCDF) said in a Facebook post that it responded to the fire at about 9.20am. When firefighters arrived at the scene, black smoke was seen emitting from a unit on the 4th floor. Stompers Fiveros, Xiao Pheyy, Shawn, Adriel & Maria alerted Stomp to the fire. 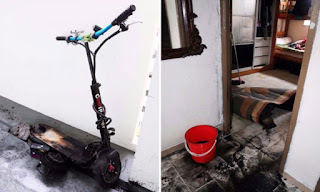 4 people were injured after an e-scooter, that was left to charge overnight, caught fire in a 10th-storey unit at Block 260 Yishun Street 22 on Tue (Nov 7). In response to media queries, the Singapore Civil Defence Force (SCDF) said that it was alerted to the incident at 10.40am. The fire was put out by SCDF officers using buckets of water. With several cases of fire resulting from Personal Mobility Devices (PMDs) being charged overnight, it is no wonder that people have become more cautious with charging their e-bikes and scooters. However, these e-bikes were found charging at the void deck of a block in Lavender. 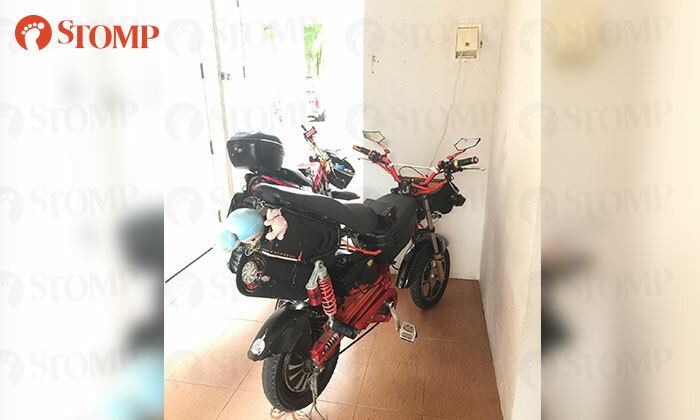 Stomper Frankie came across two e-bikes being plugged into a public power socket at the void deck of Block 816, Jellicoe Road at around 9am on Sunday (Jan 28). "I was on the way home, about 200m away from the junction when I heard two loud 'popping' sounds at around 12.45pm." He later went past the traffic junction at around 1.35pm near NEX shopping centre and saw several firemen extinguishing an e-scooter that had caught fire. 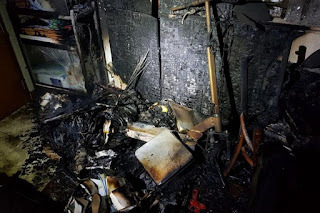 The massive fire that engulfed a landed property near Farrer Park MRT station on Friday evening was caused by a power assisted bicycle that was charging. 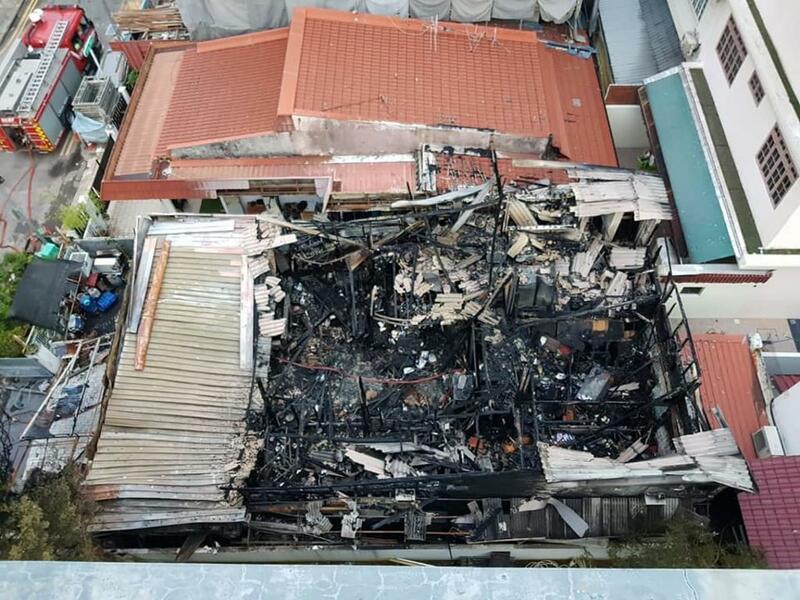 Preliminary findings indicate that the blaze that tore through the terrace house at 82 Sing Avenue “is of electrical origin & had originated from a power assisted bicycle which was being charged”, said the Singapore Civil Defence Force (SCDF) in a Facebook post on Sunday (Jul 8). Members of the public can prevent such fires by not overcharging batteries, placing personal mobility devices on hard flat surfaces when charging to allow for optimal heat dissipation, and not charging the batteries near materials that catch fire easily, said the SCDF. At about 5:30pm today, SCDF responded to a unit fire at block 867A, Tampines St 83. 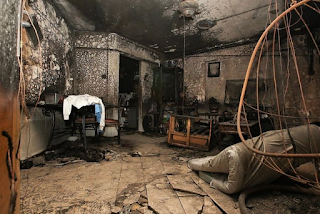 The raging fire had engulfed the living room and three bedrooms on the second level of the maisonette unit. The fire was extinguished by SCDF using two water jets. There were no reported injuries. The occupants of the affected unit and about 40 other residents evacuated prior to SCDF’s arrival. Preliminary investigation findings indicate the cause of fire is of electrical origin, and had originated from a Personal Mobility Device (PMD) which was being charged. The popularity of PMDs in Singapore has risen in recent years and so has fires involving PMDs. SCDF would like to remind members of the public on the prevention of such fires. E-bikes, the eco-friendly option compared to the ones running on fuel is quite popular among Singaporeans. I have seen a few whizzing past me in my neighbourhood—Singaporeans literally moving towards the smart nation initiative (was it a bad pun?). Just like any other electric device, we have to charge it but what happens if you overcharge it? 4 people, including an infant, were injured after a fire broke out in their Bukit Batok flat early on Thursday (Oct 12) morning. The Singapore Civil Defence Force (SCDF) said it was alerted to the incident on the 2nd floor of Block 231, Bukit Batok East Avenue 5 at about 3.50am. Yesterday morning (Thursday October 12) an infant, as well as three others, were injured in a fire that broke out in a Bukit Batok flat, according to news reports. The cause of the fire is suspected to be related to the overnight charging of an electric bike. 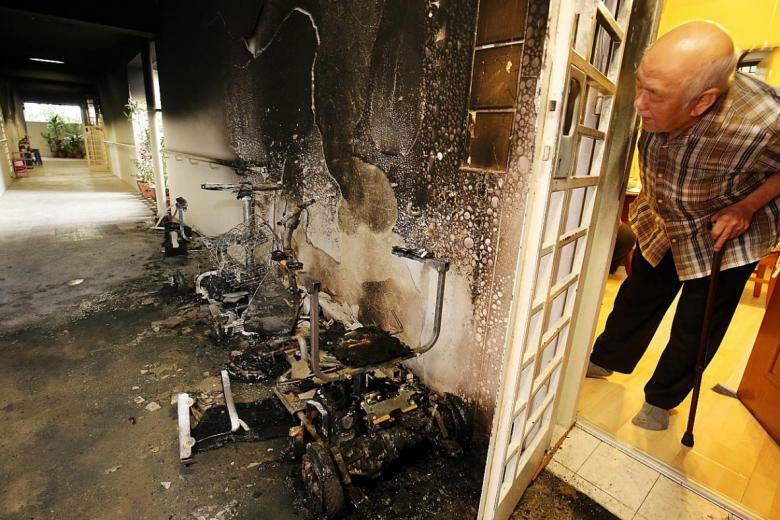 The Straits Times reports that the e-bike that caught fire belonged to the residents of a unit on the second floor. However, it was parked near the door of the opposite unit, where the residents are a couple and their newborn baby. They also sustained injuries in the blaze. 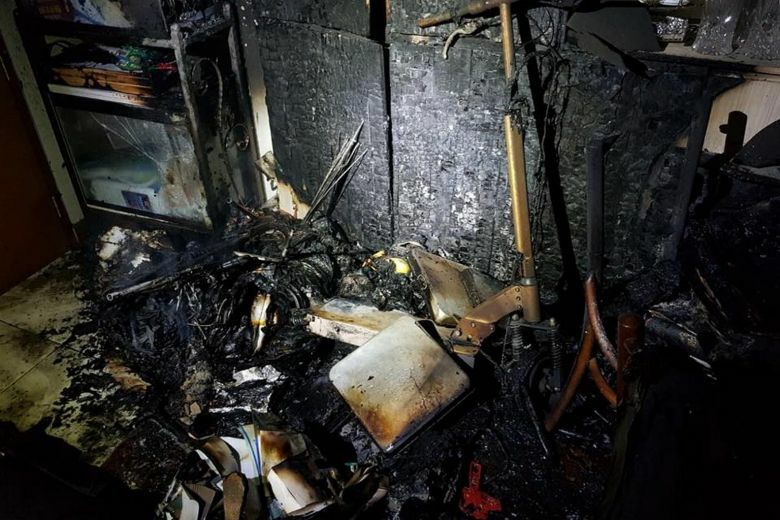 This is not the first time a fire has been caused by an overcharged electrical item, including e-bikes, phones and power banks. Last year, according to the SCDF, e-bikes caused 17 fires. Personal mobility devices caused 14 fires – up significantly from just one the previous year. A resident of a flat and 3 other neighbours, including an infant, were injured during a fire caused by overnight charging of an electric bicycle on early Thursday (Oct 12) morning. The fire broke out on the 2nd floor of Blk 231 Bukit Batok East Ave 5. 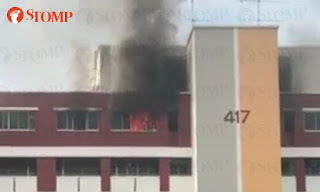 The Singapore Civil Defence Force (SCDF) said that the four suffered “minor injuries” and were taken to the National University Hospital (NUH). The SCDF said it was alerted to the incident at about 3.50am, and put out the fire with a water jet. 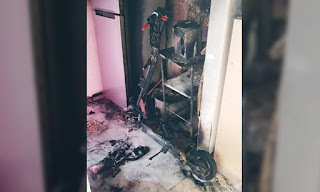 A fire that was caused by overnight charging of an electric bicycle occurred on the second floor of an HDB block in Bukit Batok, injuring an infant and three other residents. 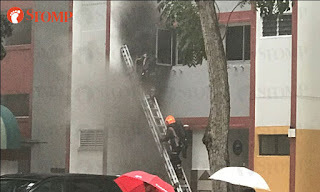 In a post on its Facebook page on Thursday (12 October), the Singapore Civil Defence Force said that it was alerted to the fire on the second floor of Blk 231 Bukit Batok East Ave 5 at about 3.50am. The injured were sent to National University Hospital for minor injuries. 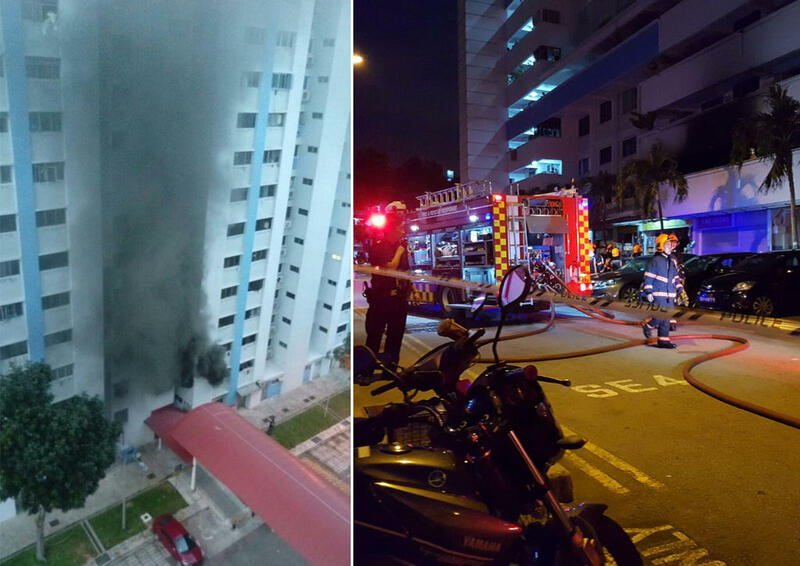 In the early hours of Thursday morning, a fire blazed its way through a Bukit Batok flat, injuring four residents. 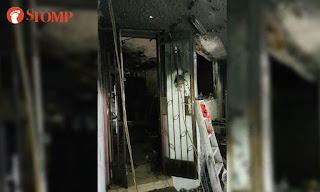 The Singapore Civil Defence Force (SCDF) was notified of the incident on the second floor of Blk 231, Bukit Batok East Ave 5 at 3:50am, and officers extinguished the flames with a water jet. 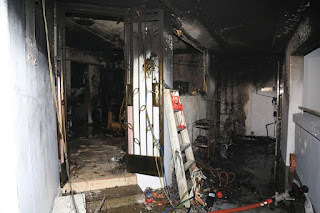 Preliminary investigations showed that the fire, which involved the contents of a living room and corridor, was caused by the overnight charging of an electric bicycle. The four people, including one infant, suffered minor injuries and were brought to the National University Hospital, reported Channel NewsAsia. 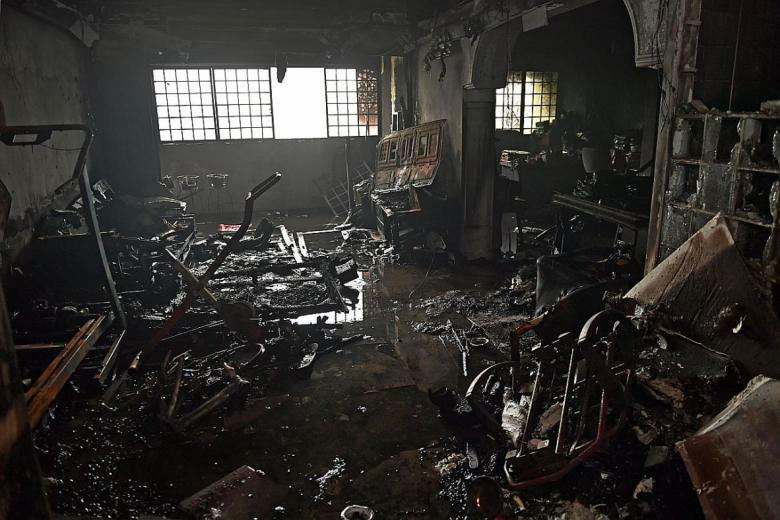 An electric bicycle that was left to charge overnight sparked a fire outside a Bukit Batok flat early on Oct 12, with four neighbours including a five-day-old baby taken to hospital. The incident occurred at Block 231, Bukit Batok East Avenue 5, at 3.50am, the Singapore Civil Defence Force (SCDF) said in a Facebook post. A living room and corridor were razed by the fire, which SCDF put out with a water jet. At least four people, including an infant, were injured on Thursday after a fire broke out in their Bukit Batok flat early in Singapore. According to reports, the wounded people were taken to the National University Hospital with minor injuries. The Singapore Civil Defence Force (SCDF) told Chanel NewsAsia that it was informed about the fire on the second floor of Block 231, Bukit Batok East Avenue 5 at about 3.50 am. However, SCDF added that the fire was extinguished with a water jet. The preliminary investigations have revealed that the fire was caused by the overnight charging of an electric bicycle. 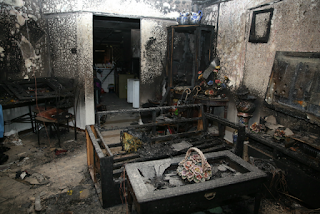 A fire broke out in the living room of a flat in Block 417 Hougang Avenue 8 today (Oct 17) at around 9.40am. In a video sent by Stomper Zulfaa, flames and a column of smoke can be seen emerging from a window of the affected Housing Development Board unit on the 13th storey. In response to a Stomp query, a spokesman from the Singapore Civil Defence Force (SCDF) said that the fire was extinguished with a water jet. 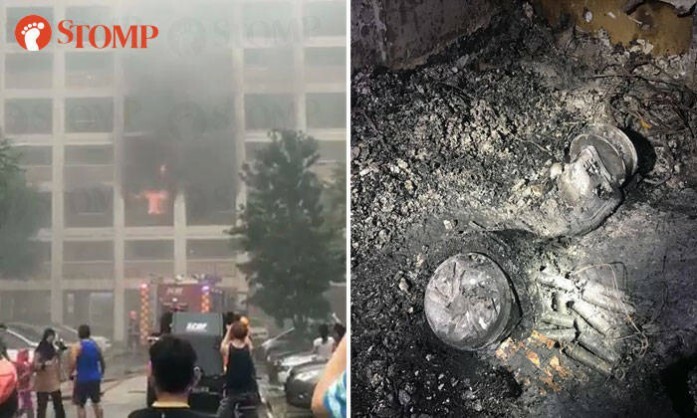 Four people were injured after an e-scooter, that was left to charge overnight, caught fire in a 10th-storey unit at Block 260 Yishun Street 22 on Tuesday (Nov 7). Four people, including a baby, were injured when an e-bike caught fire outside a unit on the second floor of Block 231 Bukit Batok East Avenue 5 today (Oct 13) at 3.50am. 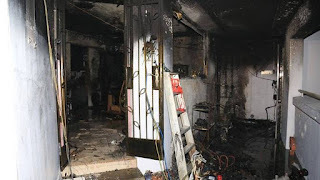 In a Facebook post, the Singapore Civil Defence Force (SCDF) said that the fire involved the contents of a living room and corridor and was extinguished with a water jet. 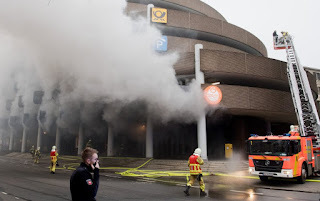 Thankfully nobody was hurt but the shop in Hannover was completely destroyed, an endangered driver also had to be rescued from the car park above the shop. Shop owners report hearing a loud bang before several fires broke out around the shop that then spread quickly to engulf the building. It took 70 firefighters and 30 vehicles to finally extinguish the inferno. Loud popping noises from outside his Bukit Batok flat roused technician Ishak Masrom from his slumber in the wee hours of Thursday morning (Oct 12). When the 56-yr-old opened the door of his 2nd-floor unit to investigate, he was greeted by a small ball of fire metres away. The fire, which grew rapidly, was apparently sparked by his neighbour's overnight charging of an electric bicycle. The father of 9 tried to put out the fire with pails of water. The flames quickly engulfed his neighbour's flat and made the corridor impassable. A fierce fire in a indoor car park in Hanover, Germany has been attributed to an e-bike’s battery exploding. 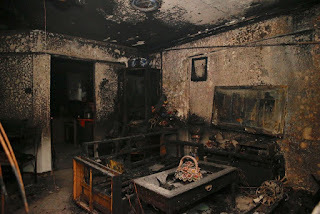 SCDF was alerted to a fire incident on the second floor of Blk 231 Bukit Batok East Ave 5 at about 3.50am this morning. The fire, which involved contents of a living room and corridor, was extinguished by SCDF with a water jet. Four residents, including an infant, were conveyed to NUH. 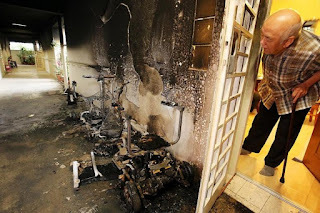 Preliminary investigations indicated that the fire was caused by the overnight charging of an electric bicycle. 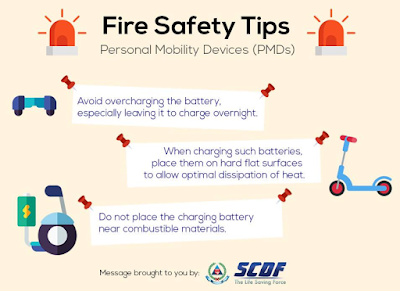 With the popularity of personal mobility devices (PMDs) such as electric bicycles in Singapore in recent years, SCDF would like to remind members of public on the prevention of such fires. 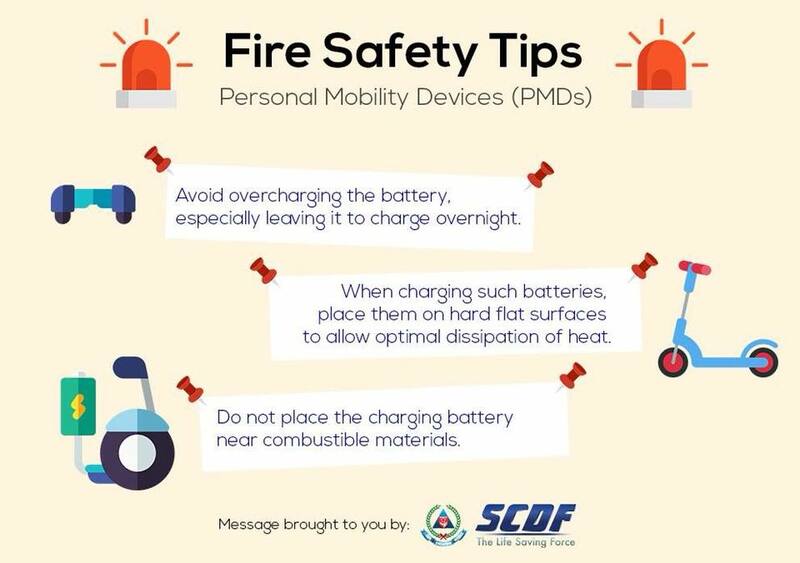 The following are some fire safety tips on the prevention of battery fires involving PMDs. A fire broke out in a Housing Board flat at Tampines Street 83 on Saturday afternoon (Jan 20), prompting 40 residents in the block to be evacuated. The Singapore Civil Defence Force said it was alerted to the incident at Block 867A at about 5:30pm, adding that the blaze was extinguished using 2 water jets. 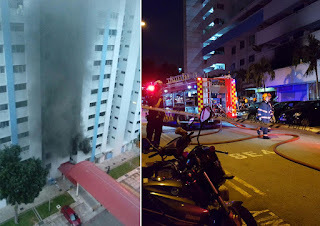 More than 65 residents were evacuated after a Housing & Development Board (HDB) flat in Serangoon North Ave 1 caught fire on Thursday (Jan 19) evening. 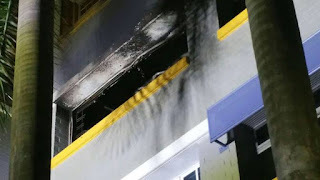 The Singapore Civil Defence Force (SCDF) said that they were alerted to the fire at Block 147, Serangoon North Avenue 1 at 7:15pm. The contents of a bedroom were on fire. A total of 16 residents who were “in close proximity & directly above” the affected unit were evacuated, the SCDF said. An additional 50 residents from the block were also evacuated. She was asleep in the 5-room flat when the incessant ringing of the doorbell woke Miss Nur Atiqah yesterday morning. The 22-yr-old, who was alone in the 16th-storey flat, then noticed black smoke. Frightened, Miss Atiqah, a biotechnology student at Northumbria University, rushed out of her room to answer the door. 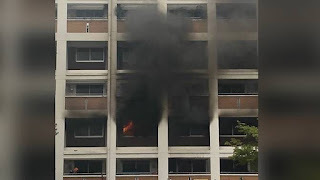 About 70 residents were evacuated after a fire broke out at Block 45, Toa Payoh Lorong 5 on Wednesday morning (10 January). 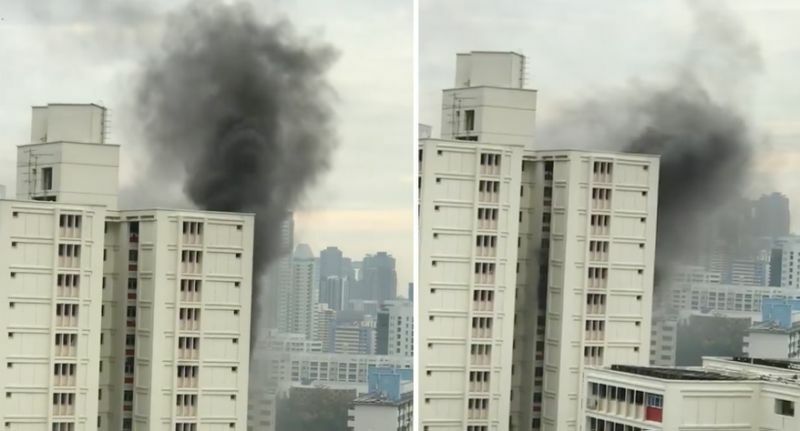 The fire occurred in a flat on the 15th floor of the block, said the Singapore Civil Defence Force (SCDF). SCDF was alerted at 9.40am and forcibly entered the unit. The fire, which involved contents of the living room of the unit, was extinguished using two water jets.